Below is a stock photo of this new Finnmarken ship built here in Norway just last year. 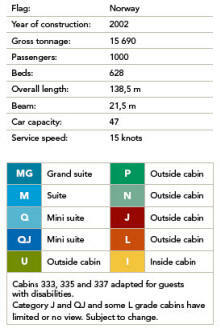 It can carry 1000 people and 47 cars. 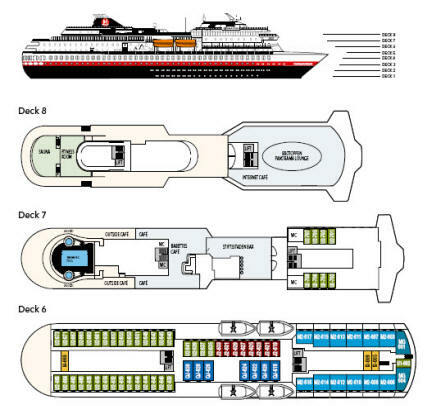 Below is a diagram of all the eight decks showing where the various style rooms are located. 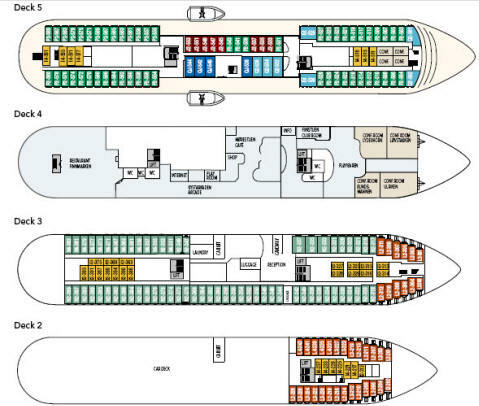 We were on Deck 5 in Room #539. I had to wake up at 8 AM because we had to get packed since the ship was arriving in Trondheim at 8:15 and it did so exactly on time. 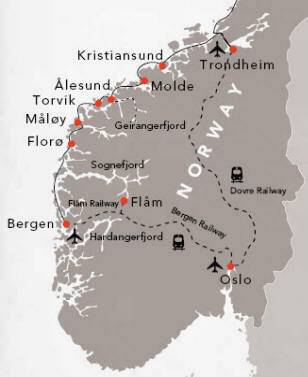 Below is the map of the trip we have just taken from Bergen to Trondheim. 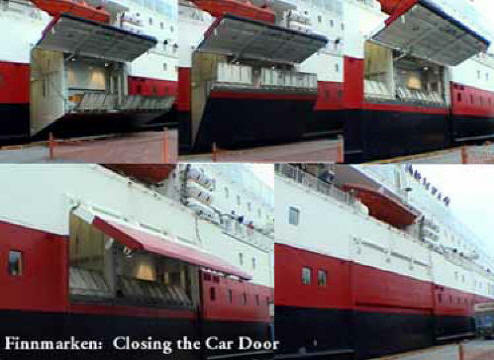 Here is how you drive your car off the boat. By 8:30 we had the car off and were driving to the city of Trondheim. As we pulled into the Trondheim harbor we could see the Island of Munkeholmen (above left) out in the bay (Tronheimsfjorden just off Fosen Quay). 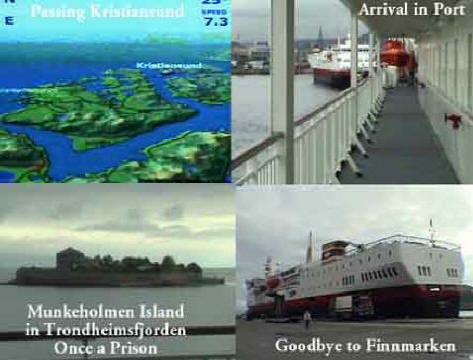 The island has served as a monastery, a fortress and a prison. 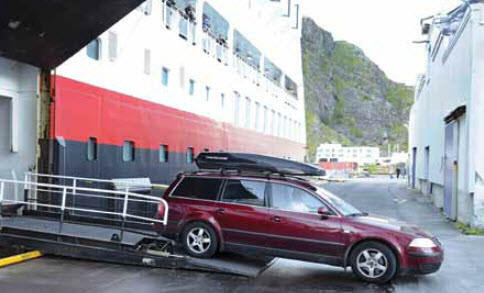 By 8:30 we had the car off the ship and were driving from the port toward the city of Trondheim. We have now crossed into the Trøndelag region of Northern Norway. 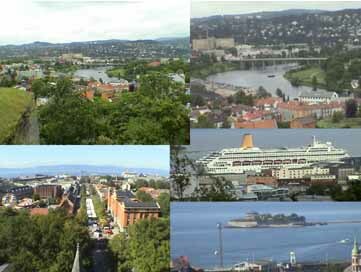 The city (right) is way inland on the fjord and is the capitol of central Norway. It was originally called Nidaros and once was the first capitol of the Norwegian kingdom. 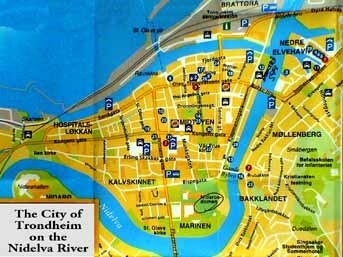 The city was founded by Olav Tryggvason on the mouth of the Nidelva river in 997 AD. The most important historical event here is that in nearby Stiklestad, King Olav Haraldson died in battle and he later became St. Olav. It was St. Olav’s body that was the nidus for the erection of the huge pilgrimage cathedral called Nidarosdomen on the site of Kristkirken over the grave of St. Olav. During the Reformation in 1525, Archbishop Olav Engelbrektsson hid the casket of St. Olav in a castle he built on a small nearby island called Steinvikholm. Nidarosholmen (the cathedral) was begun in 1320 and is the largest Norwegian building from the Middle Ages. We drove into the city and got a little lost and wound up at the top of a hill at what looked like a fort of some kind. The sign said it was closed this early in the morning but people were wandering around so we went onto the property. From here you could see all of the city and the Finnmarken sitting in the port. 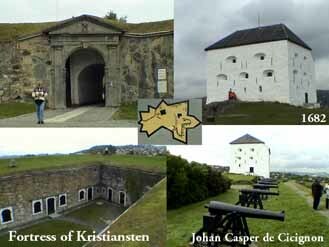 We discovered it is called the fortress of Kristiansten (above) and was built by Johan Casper de Cicignon, the military engineer who was responsible for rebuilding the city in its grid pattern after the disastrous fire of 1681. The views of the city from this hill were spectacular. 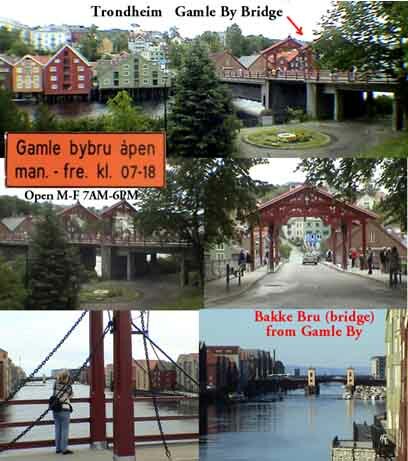 We then drove down into town and found the lovely “old town” area of Trondheim along the river area called Bakklandet. Since our hotel was out of town and it was too early to check in, we decided to wander around and do some touring.